Today’s installment of Fashion Friday has been written by guest blogger Laine over at you do doodle too. She’s a dedicated rêveuse and otherwise just a wonderful human being in every way. Her blog is fun to read, but she’s a little nervous about expanding her audience. Let’s give her a nice welcome, shall we? Here’s the link to her guest post today, which she’s published on her own blog as well. In it, she discusses how to turn an ordinary item that so many of us need into an actual fashion accessory and her recent mild tribulations in trying to do so. 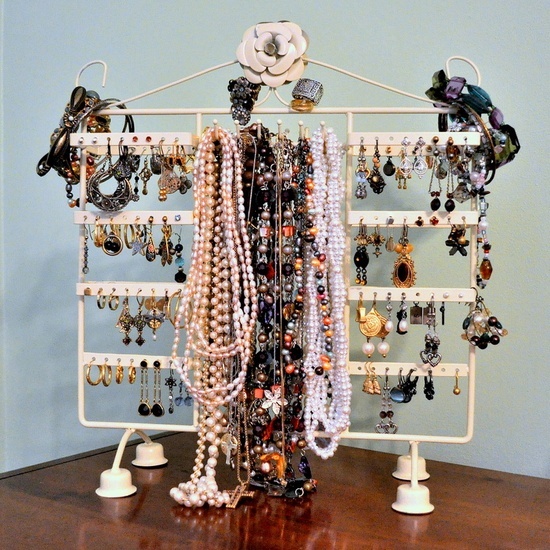 Here’s a photo of Laine’s jewelry stand. Hint: the accessory she’s written about isn’t on here. Feel free to browse around some of her other posts as well, particularly some of her book reviews and other goodies under the “mind” category of her archives. If you enjoyed my review of the Twilight situation, you will probably also enjoy her response to it. It feels like Monday to me because the school where I teach is excellent enough to take Columbus Day off every year. Not to give the students a break while the teachers sit through a marginally useful inservice, no, but an actual holiday. A true three-day weekend. Love! But now I’m back at work, and this gem crossed my inbox, and I felt the need to share. Many of you are already aware, no doubt, of my love of the Harry Potter opus and of my benevolent tolerance of the Twilight “saga” (put in quotes because a saga it is not, no matter how many marketing execs call it that). If you need a refresher on why I find Twilight to be entertaining but not particularly good for you if you’re young — nutritionally speaking, it’s a big bowl of candy — then click here. And then you may click here to view a delightful comparison between these two literary phenomena, from the Life As A Reader blog. Perhaps you’ve already seen it. Perhaps you will simply enjoy it anyway. I’m going to irritate a lot of my friends here. Apologies in advance, but hear me out. Leave the Twi-moms alone. They are hurting. And no, I don’t think I’m one of them. The Twilight series, for those who have not read the books — and notice I did not write “for those who have not seen the movies” or “for those who have been living under a rock,” because the books and the movies and the stuff people say about them are three different artifacts of expression, and we need to acknowledge that — is about a late-adolescent girl, Bella Swan, who moves across the country to live with her father in her junior year of high school. She has a relatively smooth transition, largely avoiding the usual problems of displacement such a situation might bring, but encounters conflict when she falls hopelessly, fecklessly into consuming, co-dependent love with a vampire. But I read the book the next week. And let me explain why I did that: I love vampires. Some other time we can get into a discussion, if you like, about what they represent from a literary or psychological point of view, about why they are so different every time a new author reinvents them, about why they come back into mainstream pop culture every half-generation or so. We can get into that stuff later, maybe. But I could tell from the movie that Stephenie Meyer was clearly doing something unique with the mythology, and I wanted to know more about it. I had heard her recent interview on NPR and was intrigued by this apparent literary phenomenon. Paranormal romance? A story based on a dream? Best-selling books written by an ordinary mom? Written for a younger audience and will probably take me all of one day to read? Sure, I’ll bite. Plus, I love vampires and am willing to give a cute story a chance. So what happened when I read the book? I became a little bit of a fan. It wasn’t great literature — it wasn’t even particularly good writing — but it was really entertaining. I went back and saw the movie a second time with another friend who had not seen it yet but wanted to, this time in a nearly empty movie theater. It was a profoundly different experience. Now I could hear all the dialogue, now there wasn’t any giggling around me, now I had the context of the novel in which to frame the movie. It was still poorly acted and poorly directed, but now, well, it wasn’t so bad. I sort of got it. It was easy to willingly suspend my disbelief, to let myself sink into the goofy fantasy of it for a couple of hours. And I admit it was a little embarrassing to be able to do so when so many of my friends had such disparaging things to say about it, but oh well. To be blunt, most of them had not read the books or seen the movies. Though I love my friends, I could get only so worked up about what they thought. But beyond that, I think this series has been incredibly popular with teenage girls and mature adult women for one particular reason that is the same for both very different age groups: Bella Swan is incredibly flawed. I criticized Bella, too, until I remembered my own youth, remembered experiencing these emotions in the first place, remembered being seventeen and so desperately in love that I was willing to make really stupid choices. Perhaps I saw in Bella what I regret about my own life. This can make any protagonist – and frankly, any person, in a book or not – annoying. This makes these books, well, a little bit inspiring. You know, on a subconscious level. Who doesn’t want to feel like she (or he, for that matter) is so lovable, warts and all, that the object of her (or his) affections could possibly reciprocate them with such passion? It’s wonderful to imagine that we are more than the sum of our flaws, that others can see past the imperfect body, the neurotic habits, the lack of self-confidence, the constant need for reassurance and just love us. Adore us, even. Find us so compelling that their need for us is just as intense as ours is for them. So why do I say the Twi-moms are hurting? (And sure, some of them aren’t.) This story just might represent something they feel they have lost. Even if they haven’t — even if what they think they’re missing is only buried deep down under layers of marriage and children and the demands of a career and household minutiae and far too busy weekends and having to actually schedule date nights with their spouses and a general lack of time for themselves — this story just might remind them of that thing inside of them that is young and vulnerable and desirable. It’s like a princess story for grown-ups: a damsel in distress hidden within the trappings of the modern age. So go easy on these vulnerable matrons. Absolutely, teach the young kids enjoying these books and movies that Bella is messed up hard-core, that her choices are weak, that her priorities are badly skewed. Teach them that life does not in any way resemble this fantasy, and teach them why, and teach them how to avoid being victims. But if enjoyment of this story isn’t interfering with real life, if it’s not hampering the fulfillment of their duties and obligations, if it’s not messing with their sense of reality, let the Twi-moms enjoy themselves. Don’t be haters just because you don’t understand. And if you know a Twi-mom and don’t think her obsession with Twilight is healthy, then give her something else to read. You know, something with literary merit. (2) The answer to this question is that he is demonstrating his Otherness. You know, in case you were still wondering. (3) Totally talking about the books here. The choice between Taylor Lautner and Robert Pattinson is laughably the choice between Child on Steroids and Child Unwashed. Barf. (4) I had heard and read the criticism that she was injecting religion into her story, but honestly, I don’t think it goes that far: the issue of morality is not belabored any more than in any other thoughtful exploration of the Human Condition, and the question of whether Edward has a soul isn’t truly answered.